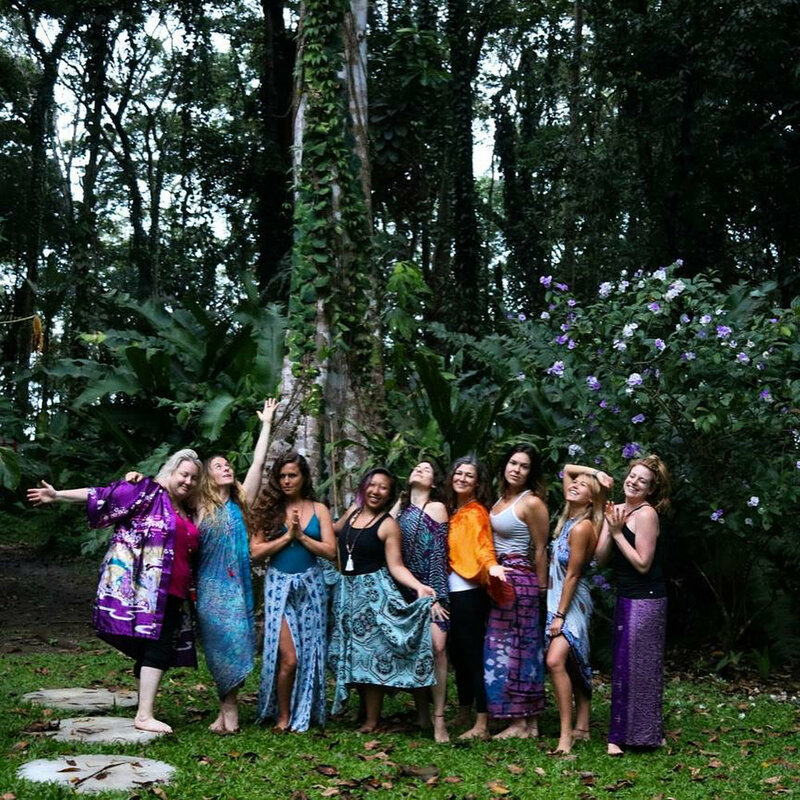 My time in Costa Rica on the Jungle Goddess retreat was more amazing than I imagined it could be. I experienced love and connection at a whole new level. It was a week of love, connection, loving words, feeling like I belonged, feeling accepted, feeling safe and held and cared for. I ate food created with love and did not have to think about my meals for the entire week, which allowed me more capacity to focus on healing, connecting, and growing. With all the space that was held for me to feel safe, I was able to courageously explore. I walked barefoot through the jungle alongside my sisters. I walked alone through the jungle. I swam in Caribbean Sea with my sisters. I climbed into a cove past sea urchins to see the most magnificent natural archway I have ever laid eyes on. I climbed slippery rocks and trees. I released everything and ran naked into the ocean. I connected with my Self. The yoga classes were filled with loving words and affirmations that held me and empowered me. The DANCEmandala classes were beyond what I expected. They were a movement and stillness meditation. I felt it all in my body. They took me through the entire gamut of my emotions. By the end of the week, my mind was quiet enough and I had released all the stress, negativity, and anxiety from my day to day life, that I was able to hear my heart's whisper. I could hear my intuition and my truth. The message of trusting myself, my intuition, and the Universe kept coming to me over and over and over again and I felt it, I heard it, and then one of the healers said it, just to affirm all of it and tie it up with a pretty bow. As I laid my head down at night, what played through my mind was the loving words and images from the day. I could see and hear Camille saying "You are a Goddess." I connected with my Tribe. It amazes me how deeply we are able to connect with each other when we let our walls down. The women I spent this week with are my sisters, my mirrors, my soulmates. I held space and simply listened. The same was returned for me. I was able to freely express my love for them. I could say "I love you" after knowing them for less than 24 hours. We blessed each other with the waterfall of Aloha and we received that love for ourselves each time. I belong here. I connected with Mother Nature. I hugged trees. I felt mud squish between my toes. For my entire life, I've been called to surfing and I finally got to get on a board for the first time! I felt it all: the waves, the water, the tide. I felt mother ocean pull me and push me. My surf instructor told me again and again to relaaaax (boy, I've never heard that before). I started to find my balance and center on the board. I felt what it was like to be literally on top of a wave, and for it to bring me to shore. Relaxing is trusting. I stopped the need to get it right, to get it perfect every time. I just trusted and knew that each time I started to paddle and stand up, that it was practice. And that's all this life is.